R ainbow flags have appeared all over the UK to herald the start of LGBT History Month. Colleges across Oxford and Cambridge University, the Welsh National Assembly and the Guildhall in Bath are just a few of the notable buildings that have hoisted the rainbow flag to show their support. 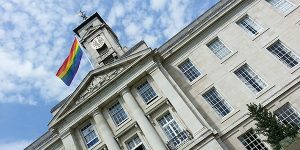 With the initiative going from strength to strength, this year marks the biggest LGBT History Month so far with education establishments, councils and other organisations up and down the country holding events and workshops to mark the occasion. This year is pertinent as it marks 50 years since the decriminalisation of homosexuality. The month was also welcomed by the official pardon of those gay men who were convicted under the laws and were forced to carry the stigma of their arrest with them for life.